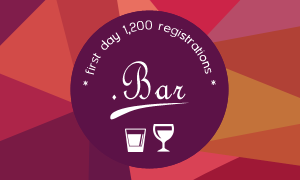 During the first day of General Availability for two new gTLDs .BAR and .REST, 1,220 domain names within .BAR and 307 domain names within .REST have been registered. Currently, there are almost 3,000 domain names registered under .BAR, according to ntldstats.com. If you are in the food and beverage industry and wish to mark your unique space on the Internet with the .BAR or .REST domains, take advantage of the momentum and register your perfect domain name. Just click on the extension to check the name availability. If you need assistance, please do not hesitate to contact our Support Team at support@web-solutions.eu or via phone on +44 (0) 208 133 3994.